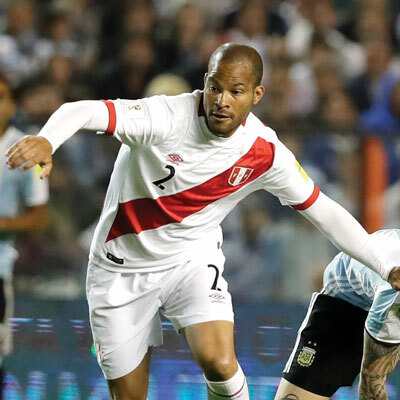 Alberto Rodriguez has made more than 70 international appearances as a defender for the Peruvian national football team. In many of those matches, he was the team captain. He has also played more than 15 years for professional teams in Peru, Portugal and Colombia. However, having a successful football career is not what Rodriguez wants people to know most about him. "As a follower of Christ, this platform makes people see not just the football player, but a person that God has made and put in this position," Rodriguez says. "This is what God wants. The Bible says we are an open book; the world looks at what we do. I want to be a good reference, a model for young people and adults to follow, not just an athlete, but a person who follows Christ." Rodriguez became a follower of Christ when he was around 18 years old through a friend he played football with. His friend invited him to church, Rodriguez liked it and continued to go. Before long, he had a personal encounter with God, who transformed Rodriguez's life and also that of his girlfriend, who is now his wife and mother of their three children. "I know without God I can't do anything. We are nothing without Him. Today as a national football player, [that] has all happened with God's help. When Christ came into my life it was a very, very beautiful, important and amazing moment," Rodriguez says. Being a follower of Christ in the world of professional sports isn't always easy. Rodriguez has experienced that, but knows God is for him. "There is always adversity in all areas of our lives; as a football player there are adversities in training, in the games," he says. "Things don't always turn out good. As a professional football player, and a follower of Christ, my banner is Christ. I realize that the Lord is always fighting for me, guarding me, strengthening me, even in complicated situations." But being a follower of Christ in the world of professional sports allows Rodriguez to reach people he might not otherwise. "We are an instrument in the hands of God to be able to share the Good News, His Word. This is a motivation. If He has put me in this position as a professional football player, it is to be light in the middle of darkness. This is an opportunity God has given me," Rodriguez says. As he leads his Peruvian teammates on the field and around the world, Rodriguez strives to make clear who he stands for. "I always want to be better. I want to leave a legacy, an example for the youth that come behind me, so football in Peru continues to develop and grow," he says. "It is important that the motivation I have is transmitted to others, so they can see not just me Alberto Rodriguez, who I am and what is inside Alberto Rodriguez. But that when they see me, they see God. They see a reflection of what God is doing in my life. This is the biggest joy for any follower of Christ." Just as Vincent Enyeama's football career was beginning to rise, he nearly died. "I'm lucky to be alive," he said in an interview following the accident. God's plan for his life included much more. There was more football to be played, and many people to influence. 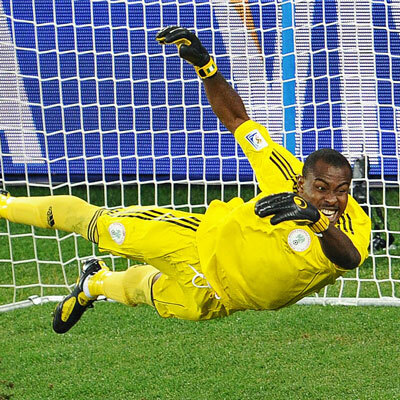 "I believe in God, I believe in the Bible, which says He chooses who He chooses," Enyeama said. Enyeama went on to play professionally in Nigeria (where he has been honored as the best player in the African Champions League), Israel and France. And after making his World Cup debut by holding England scoreless, he became a beloved member of the Nigerian national team, also known as the Super Eagles. He played as the country's top goalie in two more World Cups, one of only a few Nigerians to appear in three World Cups. Enyeama later became Nigeria's most-capped player, with 101 matches for the national team. Enyeama has led the Super Eagles to third-place finishes three times at the Africa Cup of Nations tournament. And he was later the team's captain when they won the tournament, thanks to a crucial save by Enyeama in the final. After the match, he was asked by the media how he was able make the stop. "The angels of God helped me and they made sure that my hands were in the right place to stop the ball," he said. A married man with three children, Enyeama loves God, his family and his country. "I want to give all thanks to God for all these things," Enyeama said after being voted Nigeria's goalkeeper of the year. "I wish I can give more to Nigeria, I really wish. I really desire to do more." Enyeama never hid his faith in Christ while playing with the Super Eagles. His teammates gave him the nickname "The Pastor" because he was the team's spiritual leader on and off the field. He would often lead the whole team in prayer before meals, practices and games. * These references come from the Bible, which includes the essential details on the life, death and resurrection of Jesus Christ. The Bible is divided into books, which are further divided into chapters and verses. For example, John 3:16 refers to the Book of John, the third chapter and sixteenth verse. With four knee injuries in his career, it would be understandable if Marcos Senna was disappointed with football. But it’s quite the opposite. “I have had four knee injuries, but with God’s help, I think I have coped with them well, and even experienced joy in the midst of them … I give thanks, honor, and glory to God for the strength He has given me. Senna, who was born into poverty in Brazil and began playing football in the streets at age 6, became a Spanish citizen after Luis Aragonés, Senna’s Villarreal CF coach, asked him to play for the Spanish national team. Senna played in the World Cup and also helped Spain win the Euro Cup, beating Germany 1-0. Several publications named Senna player of the tournament after he helped Spain go unbeaten in the Euro Cup. He also helped Spain win or tie 35 consecutive matches, tying the mark held by Brazil, and helped Spain win a record 15 straight games during that span. That sent Spain to No. 1 in the world rankings for the first time in the nation’s history. “Winning the European Championship was a highlight of my career and a wonderful celebration,” he says. “We eventually won on penalties. I knew that I would be one of the penalty-takers. We practiced penalties the day before, but on game day we had played 90 minutes plus 30 minutes in extra time. I was exhausted and had cramps everywhere. Yet, when the time came, I was calm and felt God’s Spirit come on me, giving me peace and clarity. With His help, I was able to shoot confidently, score, and help Spain to victory. I knew God was in charge and had a plan for me to honor Him with this accomplishment. That relationship with Jesus began in Brazil, and it has made all the difference in his life. Senna said that fame, money and other material things aren’t enough to satisfy anyone. I have spent a lifetime in football, beginning my career at 17 years old with Manchester United. Two years later, I had the privilege of helping Manchester United win the European Cup as the winning goal scorer. It was truly a great honor. From there, I went on to Manchester City, Arsenal and other British and various American teams before becoming a coach and finally, an assistant manager. Being a coach is a lovely job. I didn’t originally plan to take on that role, but I have really enjoyed it. It requires great enthusiasm and a lot of hard work. I have had the pleasure of coaching at both Manchester United and Manchester City, where I formerly played. Football has evolved since my days as a player. The Premier League is now seen all over the world and has become a big business. It’s quite exciting, but with all that money comes a lot of pressure and demands on teams. It is easy to let winning and losing become more important than the love of the game. How one deals with winning and losing is what’s important. My faith helps me keep perspective and reminds me that there are more important things than football and winning. As I deal with pressure, I often find myself praying, “Thy will be done,” and then hand things over to God. I may not get answers right away, but over time, God’s plan becomes more clear. As a young boy, my family attended church faithfully. Today, I still go to church weekly, and more if time permits. It provides much needed time of tranquility, reflection and prayer. A lot of today’s generation has no religion, and I find that to be very sad. It is comforting to believe in the Almighty God. He provides the perspective and stability needed to deal with life’s ups and downs, as well as the pressure of professional sports. In Colossians 3:2, the Apostle Paul encourages us to, “Set [our] minds on what is above, not on what is on the Earth.” Paul was repeatedly persecuted and jailed for his faith, yet was able to look past his difficult earthly circumstances to focus on God’s promises. His words are an encouraging and appropriate reminder that focusing on Christ will give us the strength to deal with the stress and pressure we may experience in life. Written by Brian Kidd, an assistant coach for Manchester City. He has also coached Manchester United and the England national team. As a player he played for Manchester United, Arsenal, Manchester City and Everton, among others. * These references come from the Bible, which, includes the essential details on the life, death and resurrection of Jesus Christ. The Bible is divided into books, which are further divided into chapters and verses. For example, John 3:16 refers to the Book of John, the third chapter and sixteenth verse. Lying in bed for two months with a broken neck, 18-year-old Ricardo Izecson dos Santos Leite made a list of 10 goals. Nevermind the fact that he was uncertain to ever play football again after fracturing his sixth vertebra at the bottom of a waterslide. Brazil had met Kaká. (The nickname, pronounced Ka-kah’, came when his older brother couldn’t pronounce his name.) He claimed his starting spot for São Paulo and within two years could cross off the entire list of goals, including playing for Brazil’s World Cup champions. Soon, Kaká stood at the top of world football, sweeping its highest individual honors: the Ballon d’Or for best in the world and the FIFA World Player of the Year. 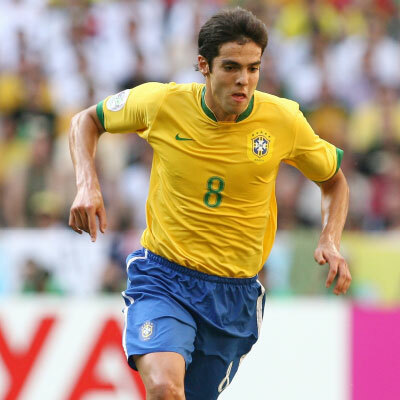 Kaká’s popularity continued higher and higher in football-mad Brazil following his breakout game. The press loved reporting on him, and he was an instant hero. After the initial shock, Kaká developed a warm accessibility with the press and fans, but he avoided the limelight and temptations of the nightclubs and paparazzi scene. As had always been the case, his family and faith were his anchor. Kaká’s accomplishments on the field obviously brought him worldwide prominence but his personal reputation has also drawn widespread attention as a novelty among international sports stars. Pick a professional athlete stereotype and Kaká contradicts it. For example, Kaká and his wife, Caroline, famously married as virgins and have talked about it openly in the press. After playing in four elite professional leagues and 92 appearances with the Brazilian national team, Kaká leaves little doubt that he is all about Jesus. To Japanese footballer Jun Marques Davidson, religion always seemed far too complicated. The rules. The regulations. The structure. Raised in Tokyo, Japan, he had little interest in Christ, even though his mother was a follower of Christ. Instead, he had his sights set on one thing: football. There were early signs he could be special, and at 15 years old he left Japan to play football at an international school in England. Success, money and fame became his primary drive in life. But it was in England, while he was alone, barely able to communicate, that he realized there may be more to life than football. After England, Davidson and his family moved to California, where he was surrounded by other strong believers on the team. It was as if God was bringing him to maturation after the start of faith he had in England. “Again, God was shaping me by providing Godly friends, fellowship and encouragement,” Davidson said. Following schooling, Davidson moved back to Japan to play professional football — and it was a clash of two worlds. When he left Japan four years prior, his heart and mind were in a completely different state. He was selfishly driven. When he returned four years later, he was becoming more of a selfless person, and he wanted football to be an opportunity to impact others who had hardly heard of Jesus Christ. His return home made him realize how much he had changed, how much work God had done in him, and how much God wanted to do something through him. Once he moved back to Japan, the defensive midfielder’s performance was steady. 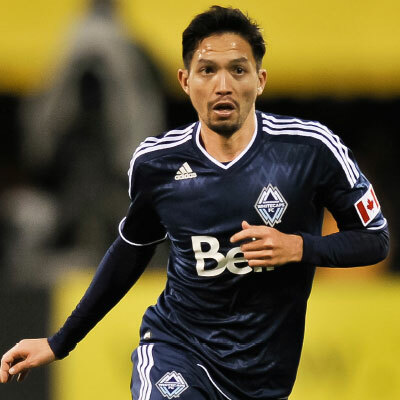 He spent his next few seasons playing in Japan, followed by playing in Canada and the United States, then a season in Thailand, then back to the United States. Davidson's surrender to a much better Author of his story has led to both purpose and peace. Born into a family of talented athletes, named after a football legend, Colombian striker Radamel Falcao has gained an elite reputation for himself within the world of sport. Falcao is currently the captain and top scorer for both the Colombian national team and his AS Monaco club team. Though he has become known as one of the world’s top football competitors, Falcao is quick to admit that his satisfaction does not rest in his athletic performance alone. Having grown up going to church with his family, Falcao made a decision to place his trust in God at an early age. Falcao says it was at this turning point that his desires and outlook on his own career changed. He has this opportunity often. His recent 30 goals led AS Monaco, and his 29 goals for Colombia are tops among the team's active roster. Falcao began his youth football career at age 15, and in his first year he was labeled “El Tigre” (The Tiger) after a particularly intense game. This is only one of the many nicknames he holds to this day, “King of the Europa League" being another. Overcoming many obstacles in his career as a professional athlete — including major knee injuries twice — Falcao has persevered and drawn strength from the Bible. Falcao began his professional career on home turf in Colombia before moving to Argentina, then to Portugal, where he won his first European title with FC Porto. Falcao once scored 17 goals in 14 games for Porto, setting a new record in the UEFA Europa League for goals scored in a single season. "El Tigre" puts his best foot forward for every competition, entering each game and practice with a prayerful heart. Eager to play in his first World Cup, Falcao saw his childhood dream of competing in the event unfolding — until a serious knee injury ruled him out. Now, four years later, the opportunity to compete in the world’s biggest football competition has once again resurfaced. When Colombia qualified for this World Cup, no one was more emotional than Falcao, who has been working toward this goal for so long. But his aim for making a lasting impact is not limited to his participation on the field, he applies this to his everyday life. Apart from his life on the football field, Falcao is a devoted husband and father of two daughters. In his own home, Falcao aims to love his family and put their needs before his own. “I think it’s similar to the love that God has for us, loving us just as we are, He created us and wants to be in relationship with us. He expects nothing in return,” Falcao said. Falcao’s family has been behind him every step of the way in his football career. Falcao married the Argentinean singer, Lorelei Taron. This young couple seeks to use both of their professional platforms to share their faith in Christ. Falcao is passionate about sharing his love for the game and love for God with others. Using the international platform of the world's favorite sport, he continues to impact athletes and fans with his positive outlook on life. Growing up in Korea, I really had no religion. The idea of God was a fairytale to me. Then, some friends who were followers of Christ shared their faith. I still had doubts, but was eager to learn more. I felt that God needed to reveal Himself to me. When I honestly searched for the truth through reading and close friends, I was amazed. God showed me that He did exist, and my heart was changed forever. I wanted Him in my life. After that, I began to study the Bible and have grown to know Him more and more. Now everything in my life is different, even my thinking. With mental anguish, I sought answers on the problem of my sinful nature; and God answered those questions with the only possible solution — Jesus. He is the one who takes away our sins! Before Christ, I struggled with fear and worried about death. Now, I understand that Jesus died for my sins, and I am free from worry and fear. My life has completely changed. Because people know I am a believer, many ask, “How much does your belief in God help you in football?” My answer is, “Playing football is helpful to my belief in God, rather than God helping me play football.” God is the most important thing to me — not football. Football is only one of many ways I can glorify and serve my Lord. Winning or losing can mean everything in football. All I can do is prepare and play my best. And when my efforts are given for Him, I can accept the results joyfully, for I believe that He is in control. There is a man in the Bible named Matthew, who was a tax collector and had little outward appearance of a religious life. But Jesus changed that. While Matthew was at work one day, Jesus called out to him, “Follow Me!” So he got up and followed Him (Matthew 9:9). Matthew’s life changed forever when he was obedient to God’s call, even to the point of receiving a new name and career. From Levi the tax collector, he became Matthew, one of the 12 disciples. Read the full powerful story of Matthew’s obedience to God and becoming one of the biggest difference-makers known for Christ! Take time to read the Book of Matthew. For more on obedience, read in the book called Romans (chapter 6, verse 4) and 1 Peter (chapter 1, verse 3). Written by Lee Young-Pyo, a defender for South Korea who played for FC Seoul, PSV Eindhoven, Tottenham Hotspur, Borussia Dortmund, Al-Hilal and the Vancouver Whitecaps, in addition to 127 caps for South Korea. Growing up in a family split in their faith backgrounds, Alexander Samedov decided he would live his life in his own way. 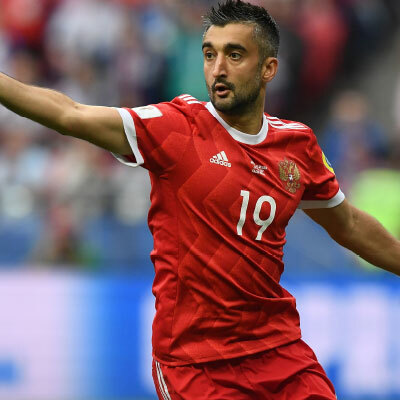 Samedov, who has represented Russia internationally on the U-21 and senior national teams and also played on several top Russian club teams, started having trouble in his football career and in his life. That’s when the questions started, first in his mind and then verbally. Though Samedov admitted to not reading much while growing up, he has loved reading the Bible since becoming a follower of Christ. But reading the Bible has been different. A welcome change from the arduous reading of lifeless words from the pages of a school textbook, or any book for that matter. Part of that direction has guided him in his career. Samedov debuted with Spartak Moscow when he was 16 years old. Five years later he moved to Lokomotiv Moscow for four years before joining FC Moscow for two seasons. After succeeding there, he went to a bigger club, Dynamo Moscow, for three seasons while also making his first senior national team appearance. That success landed him back at Lokomotiv the following season when he began excelling even more and became a regular starter and a fan favorite. He has since made 45 more national team appearances. Later, Samedov returned to Spartak Moscow. He looked to God, who spoke to him and guided him as Samedov read the Bible. God has used Samedov’s wife to show him the right path.